Financial stress ….. We are what we think. 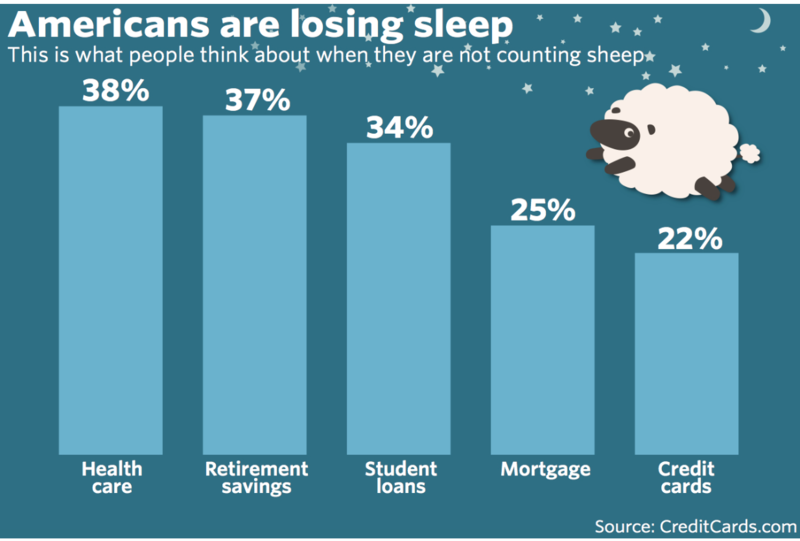 We have all had sleepless nights worrying about something…chances are, though, it was about our finances. An April 2017 study by CreditCards.com ( a credit card comparison company) showed money is causing 65% of Americans to lose sleep at night. Healthcare & insurance costs overtook retirement savings as the primary source of anxiety, for the first time in a decade. This is a 3% increase in sleepless nights since 2015. 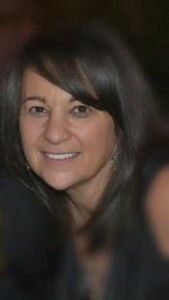 High financial stress levels and concerns over debt are associated with increased risk for ulcers, migraines, heart attacks, and of course sleep disturbances, according to the American Psychological Association (APA), and those conditions are “ just the beginning of how your money affects your body and mind.” As a result of financial stress, people adopt poor coping mechanisms, lifestyle choices. In this study the APA found 69% of Americans were stressed about money, and the most common coping mechanisms included binge eating and excessive alcohol consumption and depression is a common result of financial stress. The APA recognizes financial stress as the leading cause of unhealthy behaviors like smoking, weight gain, and alcohol and drug abuse. Other behaviors linked to financial stress are gambling and overextending credit balances. When employees turn to these coping mechanisms, the APA concluded that the stress strikes back with an even greater intensity. Financial stress is accepted as a major cause of metabolic syndrome, which can lead to diabetes, and combine that with binge eating? A recipe for metabolic mayhem. Uncontrolled diabetes leads to a number of other chronic illnesses, including heart disease, cancer, osteoporosis……Cost-related nonadherence (CRN) to diabetic protocol, is estimated to impact 20% of all patients in the United States. SunTrust Bank: Finances are the leading cause of stress in a relationship, according to a survey of people in a relationship or partnership. 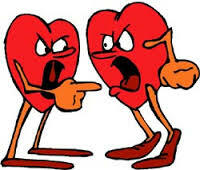 35% of all respondents experiencing relationship stress said money was the primary cause of friction. A 2013 study found that the greater the financial stress – regardless of personal income – the poorer a person’s performance was on an IQ test….Well – we all know when we are worried about finances – it is hard to think and focus on anything else. 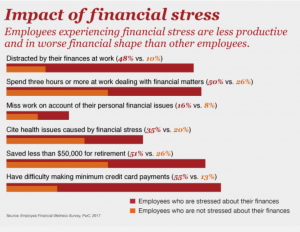 The 2017 study from PwC The Employee Financial Wellness Survey found Financial stress is negatively impacting employees and costing employers. Stressed employees are found to be less productive, take time off from work to deal with their finances, and are more likely to cite health issues caused by financial stress. Another very interesting finding of the PWC study was only 44% of those surveyed believe that their employer cares about their financial well-being ….and…..54% of millennials said that their loyalty to their employer is influenced by how much their employer cares about their financial well-being. A Feb. 2015 study published in the American Journal of Preventive Medicine suicide rose 40% since 1999, the sharpest rise started in 2007. The researchers concluded the economic downturn of 2007-2009 was a contributing factor, boosting depression and anxiety among many Americans who faced job layoffs, declining home values, household financial difficulties, and reductions in retirement savings. These “external economic factors” were tied to 37.5 percent of all suicides in 2010 — rising from 32.9 percent in 2005.
where do we even start…..
Our greatest stressor is when we feel we lose control of a situation. Financial wellness is intricately attached to health and wellness. A financially stressed employee could have a number of potential health and productivity issues. 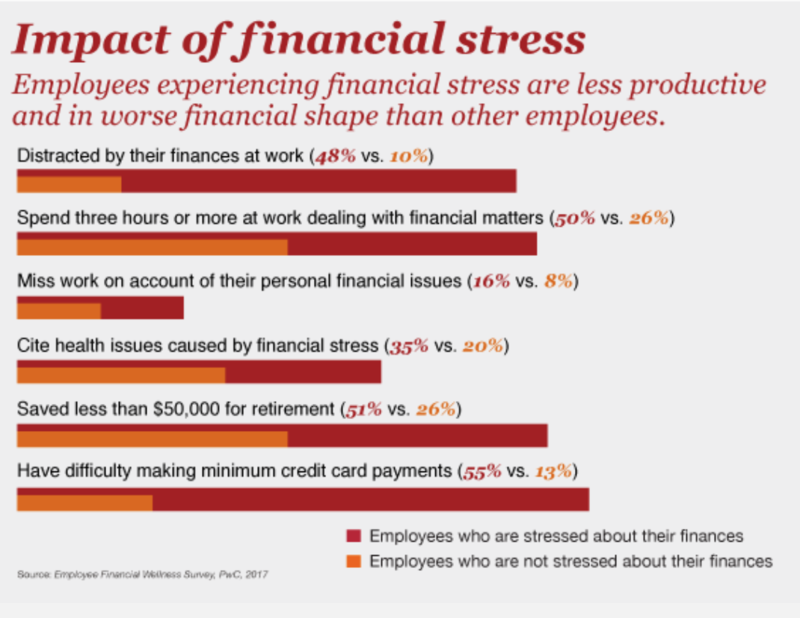 Financial stress leads to an avalanche of other well known health & workplace productivity issues. In January 2017, SHRM (Society for Human Resources Management) said 2017 should be the year of employee financial wellness programs……. If a financial wellness program is in place – are employees participating? If not, why? Create a curriculum, which will install confidence in the employees as to the success – alleviate fears over potential frustrations with the program. Survey employees, all ages and stages of life as to what will best help them. Give them a selection – many employees might not know many of the options are even possible. As someone who offers webinars regularly, I get very picky over webinar presentations. With webinars and coaching – I insist on live and interactive. Prerecorded are only for follow up. Engagement is just too important, especially when we are talking about people who could be stressed. It is almost cathartic to people when they realize there are others in the same situation. I always have various provisions for people to ask questions anonymously, but team support can be therapeutic here. The loneliness of watching webinars alone ……not my choice. Sure, follow up coaching – one on one – great. A well lead live, interactive webinar can be a great way to put people at ease, to deal with a situation. And… I am going to add to that…… health and wellness programs that include addiction recovery components. Nobody ever wants to think of themselves as an addict….harsh label…however as we have seen financial stress often leads to addictive behaviors. Example: we saw binge eating is a common byproduct of financial stress. Providing healthy eating programs…..will not cover the binge eating. Undoing coping mechanisms is a behavioral issue. Stress and depression programs and/or counselling may very well be necessary as well. Fitness programs are very often a central part of addiction recovery, especially binge eating, smoking and drugs & alcoholism, frequently associated with financial stress. I have seen the results, read the studies, the success of wearable devices for adherence to these very specific recovery programs is key to recovery, that feeling and proof of accomplishment, and gaining control to conquer the black cloud from the financial stress. My preferred health tracker for incentive programs, amongst its lengthy list of biomarkers is releasing an add on later this summer (at no extra charge) that picks up on blood alcohol levels. In the case of addiction recovery, a health tracker that can monitor the most possible biomarkers is preferred. Fluctuations in a number of biomarkers can relay significant data. Although I personally do not lead financial wellness programs, I do have very experienced financial professionals, with thorough understanding of the human heart, mind & self respect, that do offer these webinars for my health and wellness programs. I know I cannot claim to offer complete wellness programs without offering financial health. I get very irritated when I hear people use cliches such as “money doesn’t matter”, “money isn’t everything”. Reality check…..we can’t pay for the groceries by kissing the cashier. We all want to provide for our loved ones. We all agree health is a wealth, but undeniably, wealth is a part of health.